You are at:Home»Uncategorized»“A Drinking Club with a Motorcycle Problem”—The Boozefighers. It’s 1946. The war is over. Many returning veterans are adrift, missing the adventures in Europe and The Pacific, the adrenaline rush of combat, and the special camaraderie of other soldiers. Some found what was missing in their lives on a motorcycle, on the road. “Wino” Willie Forkner, Fatboy Nelson, Dink Burns, George Menker, and Snowman were all vets who met up at the All American Bar in blue-collar town of South Gate in Los Angeles. 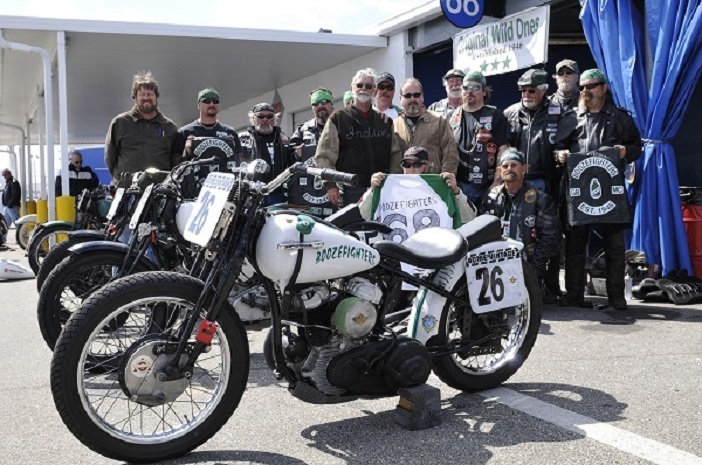 The Boozefighers club was formed, and the rest is biker history. Today, Boozefighers is a non-profit organization—not a motorcycle gang—that raises money to help vets. They have chapters throughout the US and opened their first European Chapter in France in 2006. There are other international chapters in Okinawa, the Philippines and South Korea. Many of the chapters have their own website, complete with events and rallies. Not much to them except some bad photographs of guys and gals having a good time. The second one is tied to the iconic 1953 movie “The Wild One” starring a young Marlon Brando. This movie immortalized the July 4th 1947 motorcycle “riot” in Hollister, California (near Monterrey in Northern California) that generated sensationalized media coverage of a larger-than-expected motorcycle party that got a little out of hand with a some boozing and some bike racing in town. The exaggerated news coverage spooked the nation about boozing bikers on a rampage. Casting a Marlon Brando in a movie shot in black and white just added fuel to the public perception of motorcycle riders. The Boozefighers were at the Hollister “riot” and joined in the fun. “Wino” Willie Forkner, the founder of the Boozefighers, was right in the thick of things. He is believed to be the inspiration for Lee Marvin’s character, Chino, in the movie. Here is a clip from the movie between Brando and Marvin. Classic. They don’t make them like this anymore. “The producers recruited our leader, “Wino” Willie Forkner, to be a technical advisor. I think the big thing that he’s credited for is coming up with the name Black Rebel motorcycle club. He took the 13 and combined the 1 and the 3 to make a “B” and created the Black Rebel motorcycle club, a fictional club in the movie, which was the one that belonged to Brando’s character. The other club leader in the film was Lee Marvin, who actually followed Wino around and based his portrayal on him.